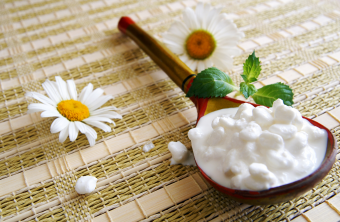 Jan B. asks: Who invented cottage cheese and why did they call it that? The ancient Mesopotamians made a type of salty, sour cheese very similar to cottage cheese that dates back to at least 3000 B.C. A common legend is that it was invented when a desert traveler filled his sheep stomach saddle bags with milk prior to beginning his journey. As the traveler and his camel traversed the hot environment, between the sloshing of the bags caused by the camel’s gait, the heat of the sun, the milk and the natural rennet from the sheep stomach, the entire process produced cheese curds. There’s probably nothing much to this story. Perhaps it was a marketing ploy of the imaginative Ancient Arabian Dairy Association… What we do know for sure is that cheese (in any form) predates recorded history. It may have originated accidentally in Arabia like the story goes, or it could be European. Wherever it happened, it does seem somewhat plausible that the practice of storing liquids in such things as bags made from animal stomachs may really have led to the accidental invention of cheese because of the rennet potentially found within. Rennet is a cocktail of enzymes that, among other things, curdles the casein in milk and is found naturally in the stomachs of ruminant mammals. Whatever the case, what we know for sure is that by the time the Roman Empire began conquering nations, cheese was already on the menu—and cheese making was a firmly established enterprise. The ancient Greeks credited Aristaeus, a son of Apollo, with its discovery, and the Old Testament refers to it. Likewise, the Egyptians depict cheese making on tomb walls that date back to 2000 BC. There’s archaeological evidence of cheese making in Poland three thousand years earlier than that. In Homer’s Odyssey, the Cyclops made cheese from goat’s and sheep’s milk, and by the time Pliny the Elder penned his Natural History in 77 AD, he devoted an entire chapter to the variety of cheeses available around the Empire, including a smoked goat’s milk that sounds like it could still win some ribbons at the Wisconsin State Fair. Whoever invented it, cheese caught on as a way to preserve the nutrition of milk for longer than a day or two and numerous types were made throughout history, including someone along the way discovering how to make the so-called “cottage” variety, which due to the ease of making it, probably was one of the first varieties ever made (or something extremely similar). Not technically requiring rennet to curdle (though particularly today with large curd cottage cheese, rennet is usually used to speed up the process and some cooks alternatively add a bit of vinegar to help the curdling along), the type of cottage cheese made in Colonial America is said to have been brought here from Central Europe, where it was/is also called Dutch cheese or schmierkase. Relying instead on naturally occurring mesophilic lactic acid bacteria, the European and American cooks simply set out milk, and especially older milk, near a fire or other warm place. At this Goldilocks temperature, the bacteria thrived in its milk bath, and after a day or two, it would transform the liquid milk into a curd, producing a form of cottage cheese. Some cooks would further treat the curd by cooking it dry and washing it with cold water, producing what is sometimes called pot cheese; others would add a bit of cream to add richness to the final product. Still others would strain and press the curd, producing farmer’s cheese. The aspect of the tea-table was not inviting. Every thing was in the smallest possible quantity that decency would allow. There was a plate of rye-bread, and a plate of wheat, and a basket of crackers; and other plate with half a dozen paltry cakes, that looked as if they had been bought under the old Court House; some morsels of dried beef on two little tea-cup plates; and a small glass dish of that preparation of curds, which in vulgar language is called smear-case, but whose nom de guerre is cottage-cheese, at least that was the appellation given it by our hostess. The tea was so weak that it was difficult to discover whether it was black or green, but finding it undrinkable, I asked for a glass of milk; and when Bayard brought me one, Mrs. Netherby said with a smile, “See what it is to live in the country.” Though after all, we were not out of sight of Christ Church Steeple. Given that the author of the piece seemed to think the audience wouldn’t necessarily be familiar with the name “cottage cheese” here, we can deduce it was either a relatively new name or a regional one that the Lady’s Book’s wider audience might not be familiar. Whatever the case, it is generally thought the “cottage” descriptor here is simply referencing this was a type of cheese regularly made in homes in the country where milk was often more readily available; cottage cheese is also relatively easy (and quick) to make compared to many other cheeses due to its unripened nature, the lack of any real specialized equipment needed, and the exceptionally small amount of processing required to get it to its final form. It has also been speculated that the “cottage” here may imply “poor quality,” or “cheese for the poor,” owing to the fact that many living in the country who had access to milk commonly made it. Alternatively it has been suggested that it is the milk that was considered “poor.” Cottage cheese was often made from the leftover liquids after churning butter, as well as relatively old milk that had become too acidic to make certain other cheeses. However, with both the “poor people” and “poor milk” conjectures, this is unlikely as the “poverty” or “poor” slant to the term “cottage” didn’t come about until much later. At the point in time when “cottage cheese” was coined, the word “cottage” with the definition “small country residence” had only been around for about a half a century and those who owned such small homesteads were hardly thought of as poor in the general case. Dip off whey that rises into colander. I always thought that there was some relationship between ricotta cheese and cottage cheese in that ‘cottage’ may have been a simplification of ri’cotta’. Yeah I thought the same thing, but that would mean cotta cheese would be “cooked cheese” which I guess isn’t a very descriptive name. But you don’t answer that question. If you didn’t know the answer, just SAY so, clearly and up front. A better title would be “history of cottage cheese”. I’ve loved cottage cheese ever since I was a young child and my mom would eat when she would “go on a diet”. All it needs is a little salt and pepper. What I found interesting is that there was no mention to the nursery rhyme “Little Miss Muffet”.. as ‘Curds in Whey’ was an old name for cottage cheese..